And I’m Barbara Klein with People in America in VOA Special English. 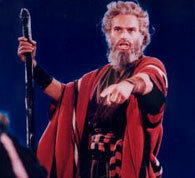 Today we tell about actor Charlton Heston. He is best known for playing powerful and heroic leaders in movies such as “The Ten Commandments” and “Ben-Hur.” Heston had a strong face and body that could express great physical and emotional force. Heston made about one hundred movies during his sixty-year career. He was also known for his social and political activism. Charlton Heston was born John Carter in nineteen twenty-three in Evanston, Illinois. He spent his early childhood in Saint Helen, Michigan. His parents ended their marriage when he was a boy. Later, he decided to change his name. He took the last name of his mother’s second husband, Heston. And, for his first name he used his mother’s former last name, Charlton. 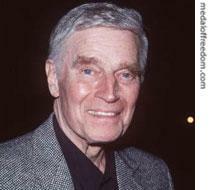 Charlton Heston discovered his interest in acting while performing in plays at his high school. He later spent two years studying theater at Northwestern University in Evanston, Illinois. But he left college to join the Army Air Forces during World War Two. In nineteen forty-four he married a college classmate, Lydia Clarke. The young couple moved to New York City after the war. They tried to find acting jobs. Heston found small roles in the theater as well as in television shows. His performance in a television version of the book “Jane Eyre” caught the attention of the Hollywood producer Hal B. Wallis. Wallis gave Heston a role in the movie “Dark City," which came out in nineteen fifty. The actor soon found other roles in movies including “The Greatest Show on Earth” directed by Cecil B. DeMille. DeMille later asked Heston to play the role of Moses in his movie “The Ten Commandments” which came out in nineteen fifty-six. Heston played the Egyptian prince who learns his true identity and leads the Hebrew people out of slavery in Egypt to the promised land. This role made Heston famous and defined his career as a hero and leader. "The Ten Commandments" was long, very costly and had many special effects. In nineteen fifty-eight Heston starred in “Touch of Evil.” He played a Mexican drug investigator. Orson Welles also had an acting role in this film. Heston persuaded Universal Studios to hire Welles to direct the movie. "Touch of Evil" has since become a great example of the kind of crime movie known as "film noir." The nineteen fifty-nine movie “Ben-Hur” made Charlton Heston an even bigger star. He played a Jewish man named Judah Ben-Hur who is imprisoned unjustly and rebels against the rule of Rome in ancient Judea. The movie is most famous for a long scene in which Ben-Hur competes in an exciting chariot race against a Roman commander he considers his enemy. Recreating such a large event on film required a great amount of money and technical skill. 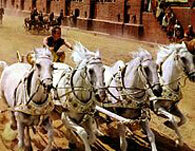 Many actors would have used a professional stunt man to carry out such a dangerous activity as a chariot race. But Charlton Heston did much of the work himself. He trained for weeks to learn how to skillfully lead a team of speeding horses. After Ben-Hur wins the chariot race, he speaks with Esther, the woman he loves. She wants him to forget about his hatred towards the Roman government in power. ESTHER: Oh Judah, rest, sleep. For a few hours of the night, let your mind be at peace. JUDAH: Peace? Love and peace! Do you think I don’t long for them as much as you do? Where did you see them? Esther tells Judah about having listened to the teachings of the prophet Jesus. JUDAH: Children of God? In that dead valley where we left them? I tell you every man in Judea is unclean and will stay unclean until we’ve scoured off our bodies the crust and filth of being at the mercy of tyranny. No other life is possible except to wash this land clean. At the time, "Ben-Hur" was one of the most costly and complex movies ever made. It cost MGM Studios fifteen million dollars to produce. The popularity of the movie alone helped improve the financial situation of the studio. "Ben-Hur" won eleven Academy Awards, including Best Actor for Charlton Heston. In the nineteen fifties and sixties, many actors used "Method acting" to produce a believable performance. Actors like Marlon Brando would explore their personal emotions and experiences to create a realistic character. Charlton Heston chose instead to use objects in real life to build a character. For example, he would think about the way his character looked and what clothes the character would wear. Heston studied intensely to understand his characters. For example, in the movie “The Agony and the Ecstasy” Heston played the role of the sixteenth century Italian artist Michelangelo. Heston learned how to paint and sculpt so that he could realistically imitate the artist’s actions. He also studied the hundreds of letters written by Michelangelo to more fully understand the artist’s personality. Heston starred in many adventure movies during the nineteen sixties. His face and body represented strength, manliness and heroism in many different roles. He played cowboys, soldiers, athletes. His movies included “El Cid”, “Khartoum”, and “The Greatest Story Ever Told.” In the science fiction film “Planet of the Apes” he played an astronaut who is enslaved by a society of intelligent and powerful non-human rulers. GEORGE TAYLOR: Take your stinking paws off me, you damn dirty ape! In the nineteen seventies, Heston appeared in popular disaster movies like "Earthquake," "Skyjacked" and "Airport 1975." Charlton Heston once said that over his career he played three presidents, three holy men and two artistic geniuses. He joked that if that did not make a person feel self-important then nothing would. Throughout his life, Charlton Heston was active in social and political causes. In the nineteen fifties and sixties, he worked to defend civil rights. In nineteen sixty-three he helped gather artists to participate in the March on Washington, D.C. to demand racial equality. It was at this historic event that the civil rights leader, Doctor Martin Luther King, Junior, gave his famous “I Have a Dream” speech. Mister Heston was a very public supporter of Doctor King. for his service in the industry. He received the Jean Hersholt Humanitarian Award from the Academy of Motion Picture Arts and Sciences. He later received other awards for his lifetime of work. In nineteen ninety-seven he was awarded a Kennedy Center Honor. And, in two thousand three, President Bush gave Charlton Heston a Presidential Medal of Freedom, the nation's highest civilian honor. Later in his life, Heston became more socially and politically conservative. He supported Republican Party politicians. And he became known for actively opposing laws to control the private ownership of guns. In nineteen ninety-eight Heston was elected president of the National Rifle Association. This organization works to oppose gun control laws. It considers the right to own a gun an important civil right guaranteed by the United States Constitution. In two thousand, Charlton Heston issued a statement announcing that he had a nerve disorder whose signs were like Alzheimer's disease. He died in two thousand eight at his home in Beverly Hills, California. He was eighty-four years old. 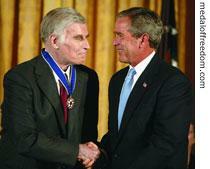 The memory of Charlton Heston will live on in the powerful heroes he brought to life in his movies. His style of acting and the movies he made represent a special period in the history of Hollywood. This program was written and produced by Dana Demange. I’m Shirley Griffith. And I’m Barbara Klein. Join us again next week for People in America in VOA Special English.